This is the third installment of the talk I gave at the Riesling Fellowship evening on Thursday, January 29th at Vintners Hall in the City of London. I was invited to speak for 15 minutes about my life and Riesling while a wine I had selected was served. The wine was the 2012 Kupfergrube GG, one of the most racy and exciting dry Rieslings of that vintage in Germany. Please read the first two installments of this story before moving onto this one if you aren’t already familiar with them. My discussions and correspondence with wine merchant Philip Eyres (1926 – 2012) during the last years of his life left me with an intense feeling of obligation to tell this story as straight as I could. I have added a few lines where it strikes me that I skimmed over an important point due to the time limit that evening. My talk was very controversial, and these blog postings will be too, but all of the following is true and for me as a trained historian that is an argument which it is very hard to reject. 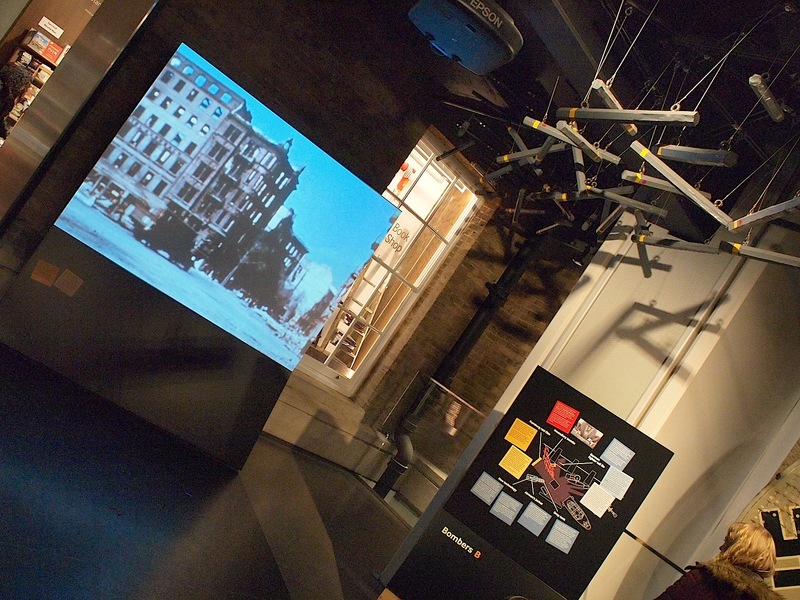 The photograph above shows the new exhibit about the RAF “Area Bombing” campaign of 1942-45 in the Imperial War Museum, which uses the example of the raids on Hamburg. The stick-like objects top right are 4 lb incendiary bombs (manufactured by ICI), the main weapon used to make that city burn like no city had ever burnt before; it was the first man-made firestorm. Seeing the ruins left by this raid while he was an officer of the Scotts Guards in the army of occupation in 1946 inspired Philip Eyres’ commitment to the Rieslings of Germany as much as his love of their smell and taste. When, in 2005, I realized why Philip Eyers had taken so much trouble to help me connect with the leading Riesling producers of the Mosel, Nahe and Pfalz I felt there was lost time to make up, so I got back in touch with him. I found that he was still working as an independent wine merchant, although he was 80 years old! We began tandem research into the air war against Germany, each adopting a different approach, but regularly exchanging our discoveries. Philip Eyres focused very directly upon the events of 1942-45 and on the perception of them in Britain today, while I explored both the backstory to those events, and what the consequences of not facing up to them after the end of WWII were for Britain and the rest of the world. Both of us experienced intellectual excitement when we were able to follow how one historical development lead to another, combined with horror at what had been considered acceptable by a country that perceived, and continues to perceive itself as fair and humane. There was no element of “Britain bashing” about this alternative history of our own country we pieced together, but we both certainly felt intense regret for every mass slaughter of civilians during WWII regardless of nationality, race or religion. What did we discover? Firstly, that Pit Falkenstein was far from being the only German civilian refugee that had been deliberately strafed by British fighter pilots. For German refugees in the last months of the war that was a common experience. Tiefflieger was their word for those Allied fighter planes that were flying so low for only one reason. Certainly German pilots also strafed civilians during WWII, but I suggest that two wrongs don’t make a right. When it came to Hamburg the facts were very clear. On the night of 27th/28th July 1943 a massive force of 787 British bombers, mostly Lancasters, dropped an enormous quantity of bombs, most of which were 4 Lb incendiaries, upon Hamburg. The weather was hot and had been so for a while, so everything was tinder-dry. This raid was codenamed Operation Gomorrah, which says almost everything. Let me quote the official Bomber Command Diary, which is part of the British National Archives: The concentrated bombing caused a large number of fires in the densely-built up working-class districts of Hammerbrook, Hamm and Borgfelde…The firestorm raged for 3 hours. The burnt out area was almost entirely residential. There were few survivors from the firestorm area…40,000 people died. What these lines also don’t tell you is that the firestorm generated winds of up to 170mph that sucked people into the firestorm where they spontaneously combusted. Although some sources give other figures for the death toll (not all of which are lower), none gives a more precise figure than the one above, and I find that inexactitude also telling. You can count the bodies of asphyxiated victims, but how do you count the dead when all that is left of them are incinerated body parts, or small heaps of ash? For comparison, 40,000 is the number of British civilians who died during the entire Blitz, a period of 267 days. I mention this not to diminish in any way the suffering of Londoners during 1940-41. Philip Eyres and I found that this scale of death and destruction was not collateral damage, much less a mistake or an accident. The bombs had hit their target and this was the intended result. Internally, RAF Bomber Command celebrated Operation Gamorrah as their greatest success to date. Soon it was no longer an exception, rather just one in a long series of massive raids that targeted the urban civilian population of Germany, their homes and much of the cultural fabric of that country. “Dresden” is the name most British people give to their misgivings about what was done in WWII. The Dresden raid became infamous because the American newspapers reported it, unlike many others before it (e.g. Hamburg) or after it (e.g. Pforzheim). There is no exact figure for the number of victims of the RAF “Area Bombing” campaign against Germany. 600,000 is the best estimate that Philip Eyres and I could find. Of course, this far less than the 6 million Jews killed in the Holocaust – mostly in an industrial manner that continues to disgust anyone with a sense of compassion – or the roughly 5 million Slavs killed in a less organized, but no less brutal manner during the same years. However, it’s still an awful lot of dead civilians to sweep under the carpet, and this is what was done by the british Establishment for a long time. The past cannot be changed, but Philip and I believed that it is far better to be honest about it, than to live in denial. In Riesling there is peace and that’s one reason I’m glad to have Riesling in my glass!